My synopsis: This is a cute story about a family who moves into a new neighborhood--where the neighbors don't appear to like kids, pets, or generally anything that might disrupt the status quo. They are always on the lookout for trouble--and they think they see it coming! A very large RV pulls up in front of the new neighbors house and a myriad of relative proceed to unload. Accompanied by wonderful illustrations depicting all of these relatives, many eccentric, the story rolls along to a satisfying ending of neighbors who aren't really looking for trouble - they are just looking to be included! My thoughts: This was a very cute book and my 4-year-old has enjoyed me reading it to him. He even reads along when we come to the sentence "Too many visitors for one little house!" The illustrations were adorable--and include a little dog which the author is trying to name. You can visit her on her website to enter the contest to name the dog. 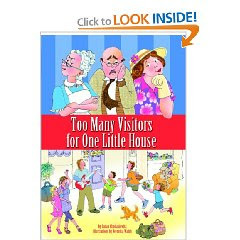 I am also having a contest for one copy of this book, Too Many Visitors For One Little House. Please leave a comment with your email address below to be entered. For an additional entry, visit my interview with the author, Susan Chodakiewitz, and leave another comment relating to the interview in some way ("nice interview" will not count. . .) If you commented on the interview prior to this post - you will get 2 additional entries! This giveaway will end Friday, Aug 7th at midnight CST. I don't know whether this is open internationally or not - will update as I get more info! Added - This giveaway is open internationally - Yeah! Love the story line. Please enter me. I just went and read the interview - left a comment there. I've heard so many good things about this book! Please enter me! Hi! Just posted on Win A Book, Krisi. No need to enter me (no little ones that small around). I would love to win this book for my grandchildren. This book looks great! Please enter my name in your draw. Thanks. I would like to be included! Children's books are the best! I was always curious about how a write and illustrator collaborate on a children's book and I liked Susan Chodakiewitz's back story about how she found the illustrator for this book. The words and illustrations work together to appeal to a child and it looks like there was magic between Susan and Veronica. I look forward to reading this book! I'd love to win this book for my niece (and me!). Thanks for the chance. I commented on your interview with Susan Chodakiewitz - which was very good, btw! My kids would enjoy this one. Thanks. What a cute story. My kids would love that. Thanks for offering it up. I teach kindergarten. Please count me in. I have read some great reviews. Please include me in your giveaway. When we have company (overnight) it's often 4-8 people! This would be great for us! I bet my 4 year old would love this! I read the interview - and found it interesting to see how closely the author and illustrator worked. I love children's books. This seems like one that we will have a lot of fun reading to our kiddos. Thanks for the chance to win it. This looks like a cute book! We LOVE picture books around here... but then again, I am a librarian! I would love to win this book it sounds very cute. I am a follower and would like to win this book. I just removed a prior post by "anonymous" (I like to call them anony-mouse - because they never leave their names) Everyone is entitled to their opinions - but the posts will only be left if they claim them - if you don't believe enough in what you wrote to leave your name - then go post somewhere else. I would really like to teach my boy english with this one! Are you hungry for another giveaway? Tome Travelers - Garage Sale Day! Purchased Pages and a Giveaway! Join me for another giveaway! Tamed by a Laird - New Giveaway Starts Today! Interview with Marie Force - and Giveaway!